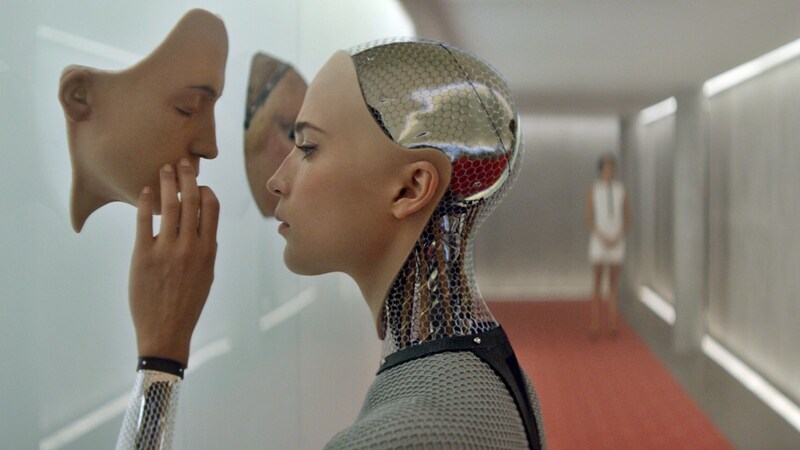 Is Ex Machina yet another in a long line of Promethean caution tales? Or is it a misogynistic nightmare about the evil extremes of genius? Or wait…is it in actuality a crypto-feminist manifesto? Or…is it like Dave Eggers The Circle or Spike Jonze’s Her a satire of a somewhat scary, occasionally lovely “watch out or we’ll be doomed in a split second if we aren’t careful” future just around the corner? With its slick production values and blank slate aesthetic, Alex Garland’s Ex Machina is all of these things and none of them. When a young programmer (Domhnall Gleeson) working for a Google-gone-mad-like company gets chosen to spend a week at the founder’s (the ever chameleon-like and always engaging Oscar Isaac) hideaway estate to work on a secret project, and it turns out to be the testing of new AI (the weirdly alluring and borderline creepy Alicia Vikander), it doesn’t take a genius to figure out where this is all going. Garland gives only brief survey-answer-like glimpses into the pasts of these two men, and well, Ava, she’s only “one” and has never been let out of her room. It makes for a mechanized affair where you’re programmed to root for the AI. But a well-played chess match where a woman outwits her captor(s) can still give you something to think about even while it refuses to let you feel anything. I mean honestly, I felt more watching the latest Apple Watch commercials. Which means the tech companies of reality and their future ambitions still have the potential to be stranger than fiction. It will be interesting to see where Alex Garland’s career takes him. Ex Machina is an auspicious albeit cold directorial debut after some successful screenplays (28 Days Later and Never Let Me Go). He joins Duncan Jones and Rain Johnson on the precipice of being the next Nolan. Here’s hoping the three realize this and compete to one-up each other, which means movie-goers who enjoy a little brains with their entertainment might finally experience a winning streak. This entry was posted in Art-house Cinema, Movie Reviews, Movies and tagged AI, Alex Garland, Alicia Vikander, Artificial Intelligence, Domhnall Gleeson, Ex Machina, Oscar Isaac, Sci-fi, Science Fiction. It was interesting to see such “big ideas” done as a chamber piece…but that claustrophobia (despite some great cinematography of the big outside environs) just added to that cold feeling of being controlled. Interesting thoughts there David. The Man v/s Machine theme is gaining more momentum in cinema than ever before. Your brief yet poignant review sure does pique my interest in this flick. Prakash – I think you’ll enjoy this one. While not particularly daring or original, it is very well done and suitably thought-provoking. Hi, David — Saw this movie yesterday with someone who’d already seen it once and wanted a second viewing. She thought it was even better the second time around. For me, I was prepared for an exploration of man vs. AI, but what surprised me was how revealing Garland was about the type of person gets involved in such an endeavor to begin with. I thought Nathan was genuinely nuts, a grand manipulator, and not that likeable. I felt sorry for Caleb — there’s very much a sense of him being in way over his head — and his emotional empathy. Ava is a product of the person who programmed her — but does she really transcend her code or is she just simulating? I really enjoyed the setting of this movie — gorgeous Nature in contrast to technology — and the interesting split between point of view character (Caleb) and main character (Ava). I’d recommend this movie as another step in the man vs. AI question that brings up some interesting angles. You make some good points about how Garland totally manipulated Caleb – I did feel bad for Caleb to an extent. I would’ve liked a more nuanced and layered depiction of Garland, however. As good as Isaac was at playing him, he was rather one dimensional – the egotistical genius trying to play god. We’ve seen this before.